Here is our motley group heading out to trick or treat. Ryan's was thrilled that our neighbors grandkids came down to trick to treat with him. They all had fun and got tons of candy. They didn't stay out the whole time but still hit a lot of the neighborhood. 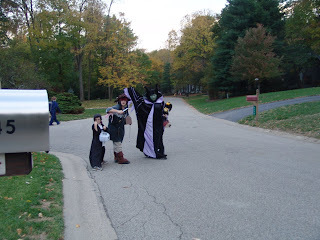 So many people were giving out full sized candy bars the kids were thrilled. They were so funny. Ryan looks just like the harry potter kid when he was young. Mom looks funny, you look scary and David looks bored. You look hot with a green face! Those are great! 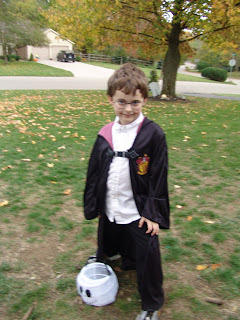 Ryan looks awesome as Harry Potter! Full size candy bars??? Where do you live? haha! We're coming to your house next year! you have a boring pirate face I guess. Jealous aren't ya Crystal! You wish you looked so hot in green. It ain't easy being green. 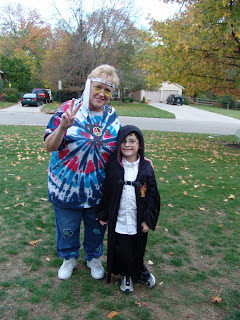 Ryan looks so cute as Harry Potter! He's perfect for the character! 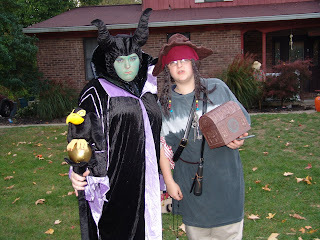 Justin went as a pirate, too.Our people said pirates were ruling the neighborhood. I'm tired of looking at your green face!!! you love my green face!